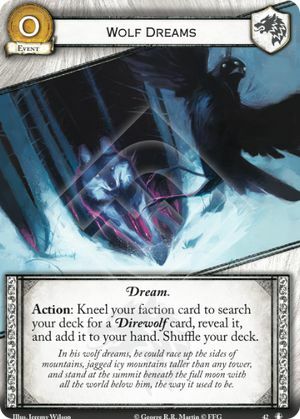 Action: Kneel your faction card to search your deck for a Direwolf card, reveal it, and add it to your hand. Shuffle your deck. In his wolf dreams, he could race up the sides of mountains, jagged icy mountains taller than any tower, and stand at the summit beneath the full moon with all the world below him, the way it used to be.